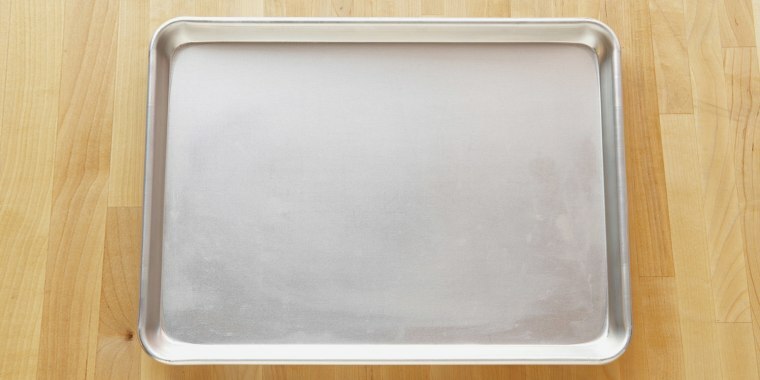 Cookie sheets start looking dingy pretty quickly, but this simple trick will leave the pan shining like new in no time! It doesn’t take cookie sheets long to start looking pretty gross. Stains, burn marks and baked on crumbs may convince you to throw it out all together — but don't! If it’s starting to feel like that old cookie sheet has seen one too many batches of treats, this home hack is here to save the day. Don't worry, you won't even have to break a sweat while scrubbing. This method of using baking soda and hydrogen peroxide will break down the grime so that it's easy to wipe right off. Watch the video above or follow these simple steps to get that cookie sheet shining like new. 1. Sprinkle baking soda on the pan. Make sure you've really covered every corner of the sheet. 2. Pour hydrogen peroxide over the baking soda. Add more baking soda on top of the hydrogen peroxide. Simply wipe all that grime away; no scrubbing required! See, that wasn't too bad! And if you have a greasy pan that could use a wash, try this method below. All you need is a dryer sheet.